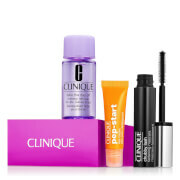 The Clinique Discover Clinique Set is a carefully curated collection of the brand's must-try products. 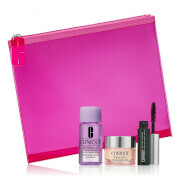 From daily cleansing to a pop of colour, each Clinique treat works to pamper and enhance the appearance of skin. Wipe away the day with this multi-tasking makeup remover that works to cleanse away even the most stubborn of makeup. Ophthalmologist tested, the formula effectively loosens makeup's grip on the lids, lashes and lips, allowing it to slide away effortlessly. Persistent mascara and bold lipsticks are swipedaway. Ophthalmologist tested. Suitable for contact lens wearers. The first step in your skincare routine. Perfect for dry combination skin, the cleansing formula harnesses all the benefits of Clinique’s Facial Soap, but in a liquid formula. Gently cleansing the skin without stripping of essential moisture and protective lipids, the face wash effectively lifts away dirt and impurities and prepares skin for the next step in your skincare regime. Catering for dry to combination skin, this is step 2 of a 3-step skin care regime. Developed by Clinique's dermatologists, the gentle exfoliating lotion works to sweep away dead cells, de-flaking and smoothing skin to reveal a clearer complexion. Cool and refreshing, the lotion prepares the skin perfectly for moisturiser and makeup application; makeup goes on more smoothly and stays put for longer. A deeply nourishing moisturiser which helps to support the skin’s natural source of hydration. Powered by Auto-Replenishing Technology, the face cream uses Caffeine to stimulate and strengthen the moisture barrier, while Hyaluronic Acid holds water in the skin cells for 72 hours. The gel formula leaves the complexion plump, healthy and infused with a natural glow. Suitable for all skin types. Free from fragrances and oils. Non-acnegenic. The third step in your skincare routine. Delivering a hydrating veil, the rich and creamy moisturiser quenches skin's thirst whilst strengthening its barrier, so essential moisture stays locked in for all day hydration. After use, skin will look soft, hydrated and radiant with a healthy glow. Skin looks youthful for longer. Quick absorbing. Gliding on effortlessly, the high-pigmented lipstick delivers weightless coverage and creamy colour with a long-lasting finish, whilst its built-in primer smoothens lips and extends wear for up to eight hours. Expect comfortable, moisturised lips with sumptuous colour. 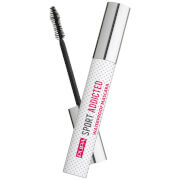 Maximise and define your eyes with this thickening, volumising mascara with a specially developed brush. Working to intensify, maximise and lengthen your eyelashes, the innovative formula and dedicated brush work in synergy to thicken and separate lashes, creating a dramatic, wide-eyed makeup look with high impact and ultimate definition. Desmaquilhante: agite bem. Humedeça bem o disco de algodão. Passe no rosto. Limpe. Enxague com água antes de voltar a aplicar a maquilhagem. Sabonete Facial: use duas vezes ao dia, de manhã e à noite. Faça espuma esfregando as palmas das mãos com água morna. Massaje no rosto desmaquilhado. Enxague abundantemente e seque a pele delicadamente. Em seguida, faça os Passos 2 e 3: a Loção Clarificante e a Loção Hidratante+ ou o Gel Dramatically Different. Loção Clarificante: use duas vezes ao dia, de manhã e à noite. Aplique com um disco de algodão, passando-o suavemente no rosto e no pescoço. Faça o Passo 3: a Loção Hidratante+ ou o Gel Dramatically Different. Hidratante: use todos os dias para uma hidratação imediata. Para um estímulo a meio do dia, aplique sobre a maquilhagem. Ou use como uma máscara de 5 minutos: massaje sobre a pele limpa e retire o excesso com um lenço de papel. Loção Hidratante: use duas vezes ao dia, de manhã e à noite. Aplique em todo o rosto e pescoço, ou onde for necessário. Uma pele limpa e esfoliada recebe melhor a hidratação. Para melhores resultados, aplique depois dos Passos 1 e 2 do nosso Sistema dos 3 Passos. Uma pequena quantidade é suficiente. Massaje uma pequena quantidade de loção onde a pele estiver seca. Batom: aplique diretamente nos lábios. Máscara: comece na raiz das pestanas, passando a escova com movimentos em ziguezague até às pontas. Repita para dar mais volume. Nas pestanas inferiores, segure a escova verticalmente. Makeup Remover: Water, Isohexadecane, Dimethicone, Cyclopentasiloxane, Trisiloxane, PEG-4 Dilaurate, Lauryl Methyl Gluceth-10 Hydroxypropyldimonium Chloride, Hexylene Glycol, Sodium Chloride, Potassium Phosphate, Dipotassium Phosphate, Dipotassium EDTA, Phenoxyethanol. Soap: Water\Aqua\Eau, Sodium Laureth Sulfate, Lauramidopropyl Betaine, Cocamidopropyl Hydroxysultaine, Sodium Chloride, Sodium Cocoyl Sarcosinate, Tea-Cocoyl Glutamate, Butylene Glycol, Aloe Barbadensis Leaf Juice, Serenoa Serrulata (Saw Palmetto) Fruit Extract, Peg-120 Methyl Glucose Dioleate, Sucrose, Menthol, Hexylene Glycol, Polyquaternium-7, Laureth-2, Caprylyl Glycol, Sodium Sulfate, EDTA, Disodium EDTA, Sodium Benzoate, Phenoxyethanol Clarifying Lotion: Water\Aqua\Eau, Alcohol Denat., Glycerin, Hamamelis Virginiana (Witch Hazel), Menthol, Acetyl Glucosamine, Trehalose, Sodium Hyaluronate, Butylene Glycol, Sodium Bicarbonate, Red 6 (Ci 15850), Red 33 (Ci 17200), Ext. Violet 2 (Ci 60730). Moisturiser: Water, Dimethicone, Butylene Glycol, Glycerin, Trisiloxane, Trehalose, Sucrose, Ammonium Acryloyldimethyltaurate/VP Copolymer, Hydroxyethyl Urea, Camellia Sinensis (Green Tea) Leaf Extract, Silybum Marianum (Lady’s Thistle) Extract, Betula Alba (Birch) Bark Extract, Saccharomyces Lysate Extract, Aloe Barbadensis Leaf Water, Thermus Thermophillus Ferment, Caffeine, Sorbitol, Palmitoyl Hexapeptide-12, Sodium Hyaluronate, Caprylyl Glycol, Oleth-10, Sodium Polyasparate, Saccharide Isomerate, Hydrogenated Lecithin, Tocopheryl Acetate, Acrylates/C10-30 Alkyl Acrylate Crosspolymer, Glyceryl Polymethacrylate, Tromethamine, PEG-8, Hexylene Glycol, Magnesium Ascorbyl Phosphate, Disodium EDTA, BHT, Phenoxyethanol, Red 4, Yellow 5. Moisturising Lotion: Water\Aqua\Eau, Mineral Oil\Paraffinum Liquidum\Huile Minérale, Glycerin, Petrolatum, Stearic Acid, Glyceryl Stearate, Sesamum Indicum (Sesame) Oil, Urea, Lanolin Alcohol, Triethanolamine, Hordeum Vulgare (Barley) Extract\Extrait D'Orge, Cucumis Sativus (Cucumber) Fruit Extract, Helianthus Annuus (Sunflower) Seedcake, Propylene Glycol Dicaprate, Sodium Hyaluronate, Butylene Glycol, Pentylene Glycol, Trisodium EDTA, Phenoxyethanol, Yellow 6 (Ci 15985), Yellow 5 (Ci 19140), Red 33 (Ci 17200). Lipstick: Ricinus Communis (Castor) Seed Oil, Diisostearyl Malate, Trioctyldodecyl Citrate, Lanolin Oil, Caprylic/Capric Triglyceride, Euphorbia Cerifera (Candelilla) Wax\Candelilla Cera\Cire De Candelilla, Castor Isostearate Succinate, Silica, Octyldodecanol, Ozokerite, Polyethylene, Bis-Diglyceryl Polyacyladipate-2, Hydrogenated Polydecene, Ethylhexyl Palmitate, Triticum Vulgare (Wheat) Germ Extract, Olea Europaea (Olive) Fruit Extract, Triticum Vulgare (Wheat) Bran Extract, Microcrystalline Wax\Cera Microcristallina\Cire Microcristalline, Astrocaryum Murumuru Seed Butter, Prunus Armeniaca (Apricot) Kernel Oil, Butyrospermum Parkii (Shea Butter), Cholesterol, Hordeum Vulgare (Barley) Extract\Extrait D'Orge, Ceramide 2, Palmitic Acid, Squalane, Lauryl Pca, Lauryl Methacrylate/Glycol Dimethacrylate Crosspolymer, Linoleic Acid, Tocopheryl Acetate, Glyceryl Stearate, Oleic Acid, Butylene Glycol, Tetrahexyldecyl Ascorbate, Sodium Hyaluronate, Potassium Sulfate, Alumina, Silica Dimethyl Silylate, Barium Sulfate, Pentaerythrityl Tetra-Di-T-Butyl Hydroxyhydrocinnamate, Calcium Sodium Borosilicate, Calcium Aluminum Borosilicate, Synthetic Fluorphlogopite, Aluminum Hydroxide, Tin Oxide. [+/- Mica, Iron xides (Ci 77491), Iron Oxides (Ci 77492), Red 7 Lake (Ci 15850), Blue 1 Lake (Ci 42090), Titanium Dioxide (Ci 77891), Yellow 6 Lake (Ci 15985), Red 33 Lake (Ci 17200), Red 6 (Ci 15850), Bismuth Oxychloride (Ci 77163), Iron Oxides (Ci 77499), Carmine (Ci 75470), Red 30 Lake (Ci 73360), Yellow 5 Lake (Ci 19140), Red 22 Lake (Ci 45380), Red 28 Lake (Ci 45410)].